CEO of the Canberra-based Cooperative Research Centres Association since 2010, Dr Peacock is a former Managing Director of the Pig Research and Development Corporation and was CEO of a successful CRC for a decade. A reproductive scientist, he holds a Bachelor degree in agriculture and a PhD in veterinary science from the University of Sydney. Australasian Pork Research Institute Limited Chairman Dennis Mutton (left) welcomed newly appointed APRIL Board member Dr Tony Peacock at APRIL’s June Board meeting in Adelaide, South Australia. Welcoming Dr Peacock to APRIL’s June Board meeting in Adelaide, Mr Mutton said he would add a significant skill set to the Board. 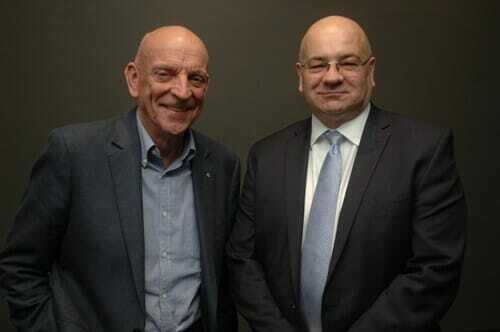 “Tony’s leadership of the CRC Association, plus his board experience with start-ups, passionate advocacy for applied research and his track record in collaboration, science communication, research partnerships and effective innovation systems, make him a great fit,” Mr Mutton said. Fellow APRIL Board members are Prof Robert van Barneveld, Ms Edwina Beveridge, Prof John Pluske, Mr Kenton Shaw and Mr Andrew Spencer. APRIL, which replaces the Cooperative Research Centre for High Integrity Australian Pork (Pork CRC), is fully member based with a budget in 2018-19 approaching $3 million. APRIL actively seeks new science and creative new ideas for its three programmes, which cover resilience, cost and return on assets. A recent first call by APRIL for research to enhance the competitiveness and sustainability of the Australasian pork industry resulted in 14 proposals being approved by the Board and funded to a value of almost one million dollars. The successful proposals included 20% to 25% applicant cash contributions, giving a total cash budget for the first round of approximately $1.2 million. APRIL Board has also approved $100,000 for education in 2018/19, to support an Industry Placement Program similar to that successfully initiated in Pork CRC, plus top up postgraduate scholarships and honours projects.